Hurghada, a town that just a couple of years ago was practically the only destination for many foreigners, now is unjustly relegated to the background. Those who year after year prefer to rest in Egypt, for various reasons begin to choose other warm resorts. But for those who have long dreamed of buying a home in the country of Pharaohs, it's the time for carry out their plans. This is the moment that properties in Hurghada can be bought not only cheaper, but almost for nothing! Especially, because the local market for foreign buyers have virtually no restrictions. Having your own home in Hurghada – like to have your own piece of eternal summer. After all, Egypt is always warm and sunny. And what could be nicer than an exceptional opportunity to be on the beach and enjoy a wonderful holiday when in your hometown is raining or snowing? Hurghada has a local airport, which makes it accessible to foreigners at any time of the year. Oh, and in this city, you cannot just sunbathe, but also to find a lot of different, very interesting activities. 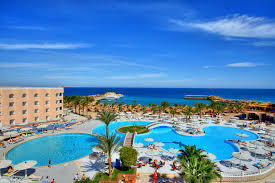 Hurghada, also known as Sakala, is the capital of the Red Sea Governorate. The town is located about forty kilometers along the Red Sea coastline, and practically does not go deep into the desert. The convenient location was one of the reasons for this rapid transformation of a fishing village into a modern leisure center. Today, Hurghada is divided into three parts: El Dahar - the old part of the city, where is located the biggest city market, the post station and the bus station, Seka - modern area with many hotels and El Cora - the most developed part of the city, where real estate is in high demand from foreign buyers. Property for sale in Hurghada - Egyptian fairy tale, which can become a reality now! Hurghada - a place for divers and lovers of nightlife. But in Hurghada, more precisely, in the vicinity of the city you will find places where you can enjoy peace and quiet, truly feeling master of the world. For example, Griftun island, which is part of a National Park. The endless clean beaches with fine sand, turquoise waters of the sea... And why not the ancient ruins of Luxor? Of course, it is simply impossible to see all within a two-week vacation. So this Egyptian tale can come true by acquiring your own home in Hurghada!